The Hilton Head area real estate market has been incredibly successful over the past year or so. Without a doubt, last year was the strongest in Hilton Head real estate history… Ever! Not only that, but statistics show that this year’s market is on pace for another newsworthy showing. In fact, a rapid decrease in distressed sales, foreclosures, and short sales suggests that the area’s overall real estate market is settling in for an era of prosperity and stability. You may be unfamiliar with the term “distressed sale.” Simply put, these types of sales are made up of foreclosures and short sales. A foreclosure is a situation in which a homeowner is unable to make full principal and interest payments on his mortgage. This allows the lender to seize the property, evict the homeowner, and sell the home. These homes are then either auctioned or sold by the lender, usually for a reduced price. A short sale is a real estate sale that generates proceeds that are less than the amount owed on the property. An alternative to foreclosure, this occurs when the lender and borrower mutually agree that selling the property and absorbing a moderate loss is preferable to having the borrower default on the loan. Only three times in Hilton Head’s history have we seen more than 500 homes sold in the first quarter, which occurred in 2005 and 2013, and now again in 2014. In fact, this year, an amazing 770 homes have been sold in the first four months, not far from the 803 peak in the first four months of 2013. There is an interesting reason for this slight decrease in sales. Last year’s numbers were bolstered by a plethora of foreclosures, distressed sales, and short sales. However, these types of sales are now rapidly diminishing as the number of homeowners who are “underwater” is declining. Actually, these distressed sales are down from 228 in the first four months of 2013 to 159 so far in 2014—a 30 percent decrease. This is a good indication that the Hilton Head area real estate market is stabilizing and will continue be successful for years to come. A reduced number of distressed sales goes hand-in-hand with an increase in “normal sales,” which have grown 7 percent in the last year. The number of normal sales, as well as the market values for Hilton Head area homes, should continue to increase in the coming years. Prices on the upswing: What does this mean for buyers? 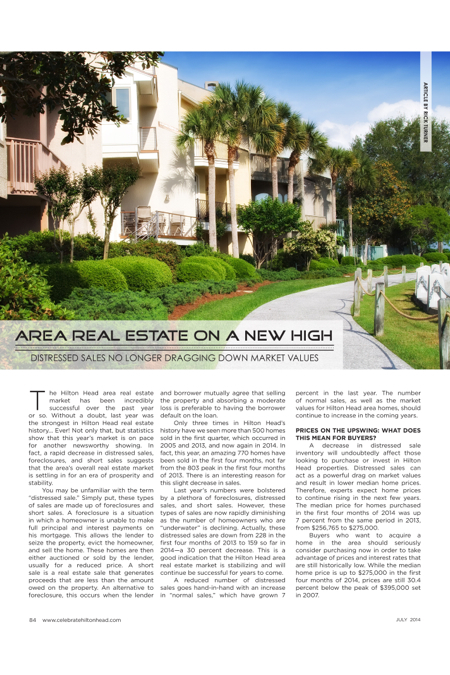 A decrease in distressed sale inventory will undoubtedly affect those looking to purchase or invest in Hilton Head properties. Distressed sales can act as a powerful drag on market values and result in lower median home prices. Therefore, experts expect home prices to continue rising in the next few years. The median price for homes purchased in the first four months of 2014 was up 7 percent from the same period in 2013, from $256,765 to $275,000. Buyers who want to acquire a home in the area should seriously consider purchasing now in order to take advantage of prices and interest rates that are still historically low. While the median home price is up to $275,000 in the first four months of 2014, prices are still 30.4 percent below the peak of $395,000 set in 2007. In addition, interest rates are still at historic lows, 4.5 percent for a 30-year fixed rate mortgage, making homes extremely affordable right now. This is really something to take advantage of right away, because even a seemingly minor increase in interest rates can cost you significantly. For instance, when interest rates rise 0.5 percent, home buyers can expect to pay an extra $54,360 on a $500,000 30-year mortgage. A home that cost $800,000 in 2007 would today sell for $560,000. The interest rate on an 80 percent mortgage back then would have been 6.34 percent, but today is 4.5 percent. The monthly payment on the same home with the same 30-year fixed mortgage would have been $3,978 in 2007, and today is only $2,335. That is a difference of $1,643 per month and a savings of $591,480 over the 30-year life of the loan! Is it any wonder homes are flying off the shelves? Historically low interest rates are not the only reason to purchase a home in the Hilton Head/Bluffton area. We recently released a new eBook that discusses “7 Reasons Why the Timing is Excellent to Buy Real Estate.” This is a guide for smart buyers who are looking to seize the opportunities available in this historic real estate market. So what are those seven reasons to buy now? 1.The Hilton Head/ Okatie/ Bluffton area real estate recession is over. 2013 was the best year for the area’s real estate sales ever. 2.If you’re borrowing, money has never been cheaper. Interest rates are incredibly low and buying now can save you hundreds of thousands of dollars. 4.The stampede of Baby Boomers has arrived. In a recent USA Today survey, 42 percent of this generation reported that the Carolinas are now trumping Florida as the preferred retirement destination. 5.The low-hanging fruit is getting picked off. The number of distressed sales (foreclosures and short sales) is decreasing fast. 6.Creativity is allowing homebuyers to save big dollars. We have used leasebacks, long-term rentals, home building, 401k fund transfers, delayed closings, and creative financing to help our clients take advantage of the deals that are currently available. 7.Life is short. Why wait to move on with life and enjoy our Hilton Head beauty and lifestyle? To learn more about these seven reasons and to find out what they can mean for you, download the entire book at hiltonheadrealestatesearch.com/7Reasons.php. Rick Turner has been one of the top realtors in the Hilton Head Island-Bluffton-Beaufort area for more than 30 years. He loves being involved in community activities and spending time with his wife, their children and grandchildren.